Gelber Bolus für Poliment Gold Verarbeitung. Dieser Bolus wird intern von Sinopia hergestellt und ist das Resultat Jahrelanger Forschung und Tests. In the late 1960's the standard Yellow Clay Bole in France changed color and the shade was lost forever. We were able to secure some samples of this historical Clay Bole for testing and color matching. This historical recreation of the Classic French Bole possesses the same rich orange brownish yellow shade that made this clay color so emblematic. Bole Clay for use in water gilding techniques. Use over traditional chalk gesso ground. Bole needs to be applied with a solution of rabbit skin glue. This Bole is manufactured by Sinopia. The formula was developed by working with master gilders to craft a rich creamy bole that burnishes to a beautiful highly reflective luster. Q: How long does the premixed French clay bole last. 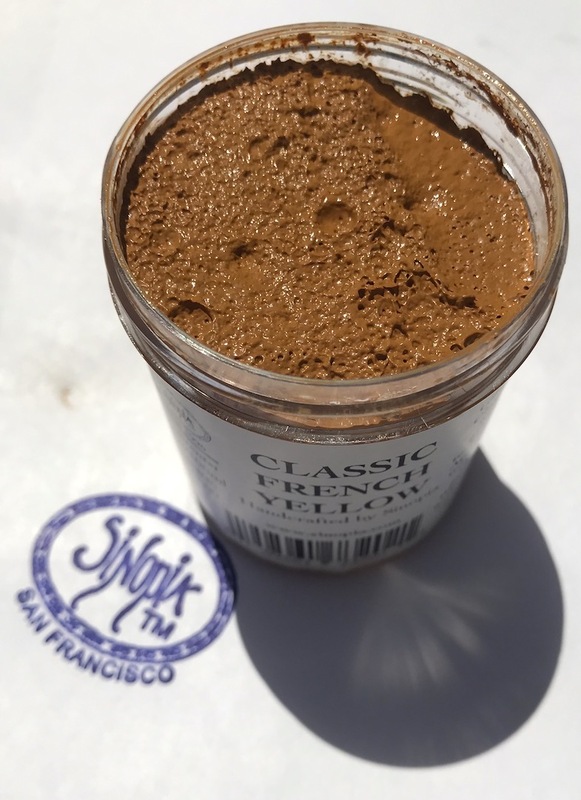 And so you offer just the French yellow clay powder? Than you . A: The shelf life on all the clays is indefinite. Even if all the water evaporates, the clay can be reconstituted with water, just like the dry cone clay. Please check our clay bole palette, for the Classic French Red Clay. A: We do not offer the French Clay Yellow in powder form.